Polly's Pancake Parlor ~~ You'll Flip Over Their Pancakes! Polly's Pancake Parlor has been in the pancake business since 1938 when the owners opened a 24-seat tearoom and served pancakes in an attempt to boost maple syrup sales. In 1938, the pancakes, waffles and French toast were "All you can eat for 50 cents." 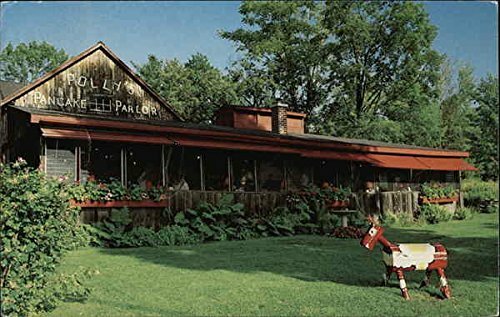 While the prices have changed, the location has not and Polly's is still located in a circa 1830s building in the White Mountains in New Hampshire. The original part of the building that houses Polly's Pancake Parlor and is shown in this early postcard, was built around 1830 and used for carriages and later for firewood storage. People travel from far and wide to enjoy the pancakes. Some think that Polly's, quite possibly, prepare the best pancakes in America. Still owned by the same family, Polly's Pancake Parlor has tripled in size and the opening season has been extended -- from three months to six months. The pancake house has passed through the generations and is now run by Polly's granddaughter and her husband. This page is a brief discussion of the history of Polly's Pancake Parlor and of my family's visit in the summer of 2008. If it is a fantastic pancake recipe you are after, be sure to visit my page The Best-Ever Buttermilk Pancake Recipe. 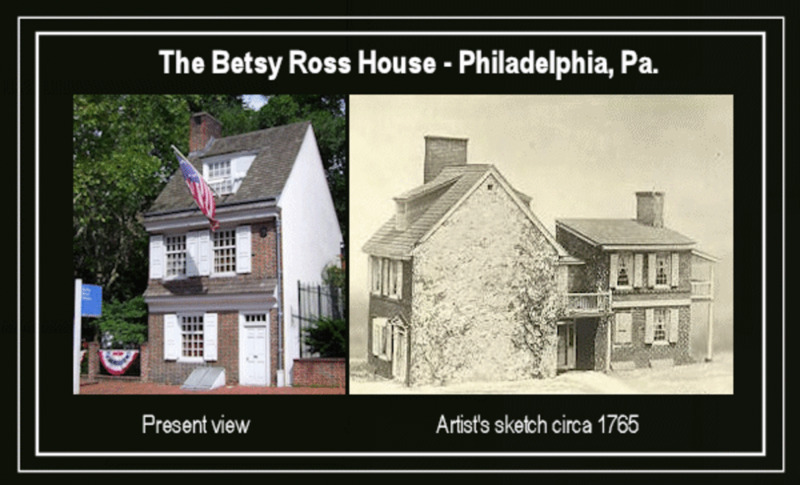 Click here to buy this Polly's Pancake House postcard from Amazon. Polly's Pancake Parlor ~~ Our Story - Was definitely well worth the detour and the wait! 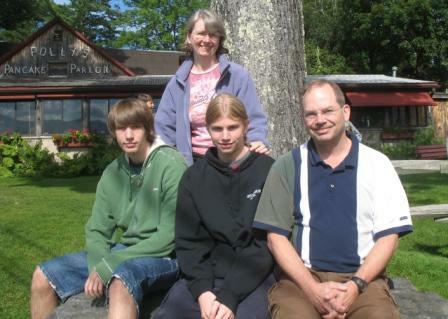 In the summer of 2008, my family took a short camping and shopping trip to North Conway, New Hampshire. While there, we made a delightful and unexpected discovery -- that Polly's Pancake Parlor was within a somewhat reasonable driving distance of our campground in the foothills of the White Mountains. Funny how memory is, though. After a couple of readers' questions about how close Polly's is to North Conway, I mapquested the distance to and Sugar Hill, it says an hour and fifteen minutes. I guess it was worth the drive to us but of course it would be more sensible to incorporate it as part of a trip rather than making it a trip on its own! Why, you wonder, was Polly's worth a drive of that length when we had never eaten there? Well, you see, our 'family' pancake recipe, the one that we have been preparing for about 15 years, came from an article discussing Polly's Pancake Parlor! The recipe is not Polly's because that is the one recipe that the pancake house refuses to share but it is one based on an adaptation of several traditional recipes. That does not matter though; we had come to think of our recipe as that of Polly's Pancake Parlor...we wanted to see how Polly's recipe faired against our own. So you see it might be said that we had been waiting for 15 years to eat at Polly's! It was more than about time! So we arose early and departed our campground with Polly's as our goal. It was a fairly lengthy drive for a vehicle full of hungry lads but we were determined. When we arrived we were momentarily dismayed to see a lot of people milling about, waiting to get in...but we approached the desk and left our name anyway. After all, we had come all the way from Canada for these pancakes! We were given an electronic paging gizmo and joined the rest of hungry adventurers in the yard and waited for our turn. When our pager finally called us, we were definitely more than ready for the pancakes and guess what? They did not let us down! They were delicious as all of the food was. The service was great and the atmosphere fun. We had just created another fantastic memory for our family memory banks! Ian Worked Up A Mighty Appetite Riding Trot Trot... - He knew good eats were coming! Just Who Is Trot Trot and Where Did He Come From? Trot Trot is a wooden horse carved in the style of a horse from an old children's book called The Little Red Horse that Roger Aldrich (the previous owner and operator of Pollly's) and his children grew up with. This Swedish Dala horse was carved to celebrate the arrival of Mr. Aldrich's first grandchild in 1988 and 'lived' until 1991 when he was diagnozed with dry rot. Trot Trot II was built 1992 and you see Ian trying out in this photo. How Many Pancakes Do You Think One Of These Teenage Boys Could Eat? Brenda, what a ridiculous question -- were they just eating pancakes or were they having other things like sausage, bacon or chili? Did you feed them the night before? Did you wake them at the crack of dawn and drive miles and miles to get to breakfast? I will take a wild stab in the dark and say more than ten??? Ten is an awful lot of pancakes. How about 5 to 10? Well, maybe if they had filled up on fruit, muffins, bacon and hashbrowns the answer might possibly be under 5.
and ask to be put on the waiting list! Polly's Pancake House is certainly the only restaurant I have been to where the waitress not only takes your order but prepares your food. 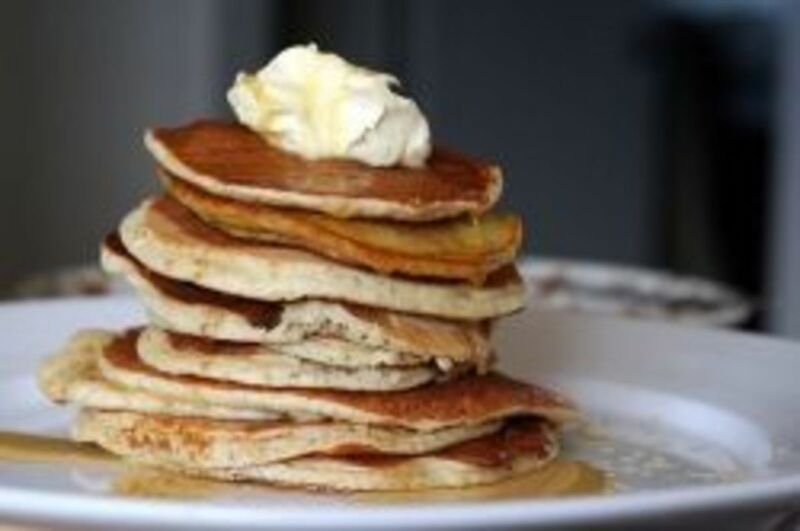 You'll have to choose between five or more types of pancakes -- plain, whole-wheat, buck-wheat, cornmeal, oatmeal-buttermilk and a daily special, like gingerbread -- with your choice of filling. (Blueberries, coconut, chocolate chips or walnuts.) Of course, there are all the regular breakfast choices like fruit, eggs, bacon and sausage. After your server has taken your order, she actually cooks it on the griddle for you herself! Everything is homemade from the pancakes to the English muffins, quiche, soups and baked beans. Even the maple syrup is homemade right there in the hills of New Hampshire by a process and some of the machinery originally invented by "Sugar Bill" Dexter, the original owner. If you know anything about it, making maple syrup is slow and time-consuming but that is the only way to make syrup that has the best flavor, color and texture. What did we order? My husband and I both had a breakfast of some sort, the details I cannot remember. It may have been three different types of pancakes, eggs and bacon or some combination like that. However, after we finished we felt we could eat just one more pancake and ordered a couple more to share. Ian and Douglas, my teenage boys, both felt they had to go for the all-you-can-eat platter. At home, we triple the recipe so we know they can eat a lot of pancakes. They did very well, especially when you consider that the all-you-can-eat meal comes with an appetizer. One son was delighted to find chili as an option and the other enjoyed some fresh melon. However, this extra food had the natural result of filling a couple of hollow spots and they did not eat quite as many pancakes as they thought they would! My favorite were the blueberry pancakes because, I suppose, they were delicious and they are the closest to me to the pancakes that I grew up with. A really nice part of the experience, as opposed to other places I have had pancakes, is that the syrup here is real maple syrup and is not served in tight rations! It was great fun and especially memorable because we have been eating The Best-Ever Buttermilk Pancakes Recipe since my boys were babies. "We don't know a better place to eat pancakes than Polly's. The Parlor is in an 1830-vintage building on Hildex Farm. 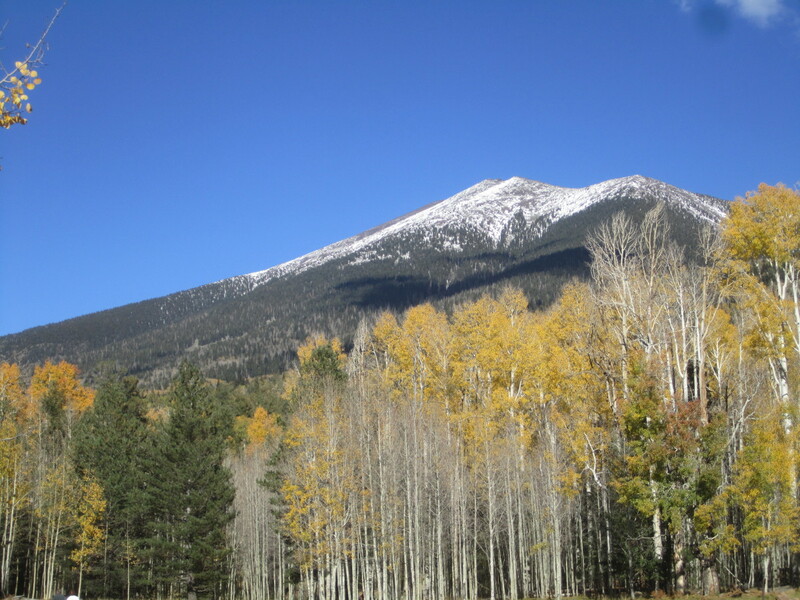 From your table you look over the New Hampshire countryside through the clear mountain air. The pancakes served here are made from light cornmeal, whole wheat, or buckwheat batter, filled with chopped nuts, blueberries, or coconut. 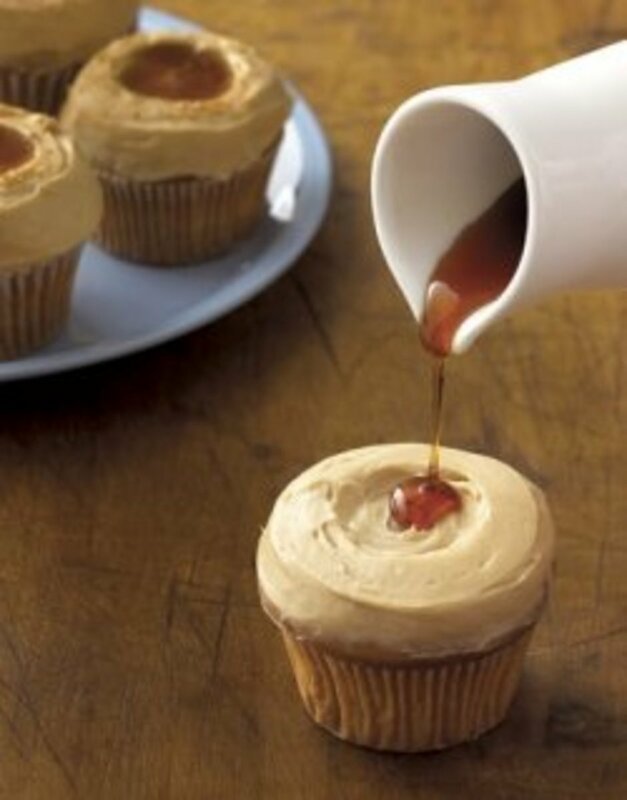 And the star of the show is maple, brought to your table as maple sugar, maple syrup and maple spread." 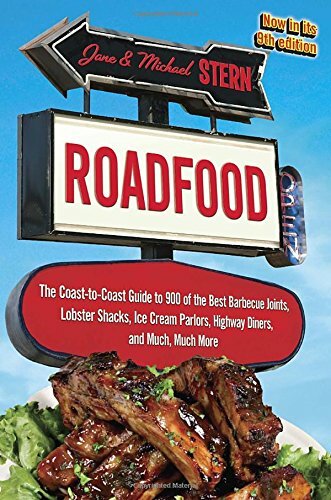 Click here to buy Roadfood The Coast-to-Coast Guide to 900 of the Best Barbecue Joints, Lobster Shacks, Ice Cream Parlors, Highway Diners, and Much, Much More from Amazon. What kind of pancakes are you going to order? Plain, that is how I like them! Whole-wheat is plain tastier to me. Buck-wheat. I grew up with buck-wheat pancakes. Oatmeal-buttermilk, a combination that cannot be beat! Are you a blueberry pancake person? Filled with chocolatey chocolate chips? Do you like your pancakes plain? You've honestly never had a pancake!?! for the restaurant and the recipes. A fantastic collection of pictures from Polly's 2008 Photo Contest winners. See 13 unbiased reviews of Polly's Pancake Parlor on TripAdvisor. It would not be fair of me to avoid the subject of cost at Polly's and I must say that the total bill for our breakfast for four was definitely a 'whopper,' especially for a meal at breakfast time. Not quite all you can eat for 50...The newspaper clipping that I have from Polly's is about 15 years old. Back then, an order of six pancakes cost $5.30; the all-you-can-eat platter $9.90. Unfortunately, times they have a-changed and the all-you-can-eat platter cost, I believe about double that amount. However, this was a once-in-a-lifetime experience for us that we will remember for a very long time, if not forever. (Hey, our story is immortalized on this page!) Pancakes are a real delight for my family and a special part of the memories that we have. Both boys have been master pancake creators for as long as they have been old enough to stand on a chair in the kitchen. Therefore, I think that this special opportunity and the yummy pancakes make the expense and effort of our visit worthwhile. What a treat! Would I go again? You bet I would, just not right away! Have You Visited Polly's Pancake Parlor? Has This Page Made You Hungry For Some Good Old-Fashioned Pancakes? Lots of good information and fun quizzes. Blessed. Early Sunday morning ... reading about pancakes ... of course I want pancakes! @NHgal LM: Thanks for the recommendation! Sounds magnificent in June. My grandmother, mother, and now my sister have had a house in Franconia, next to Sugar Hill, NH. I have been to Polly's Pancake Parlor several times, and agree that it is wonderful. But many times when I drive by there is a crowd outside waiting, so we keep on. My son-in-lasw loves it there. He says that they have the BEST eggs. I always thought that an egg was an egg, but he says that they are different and better there. 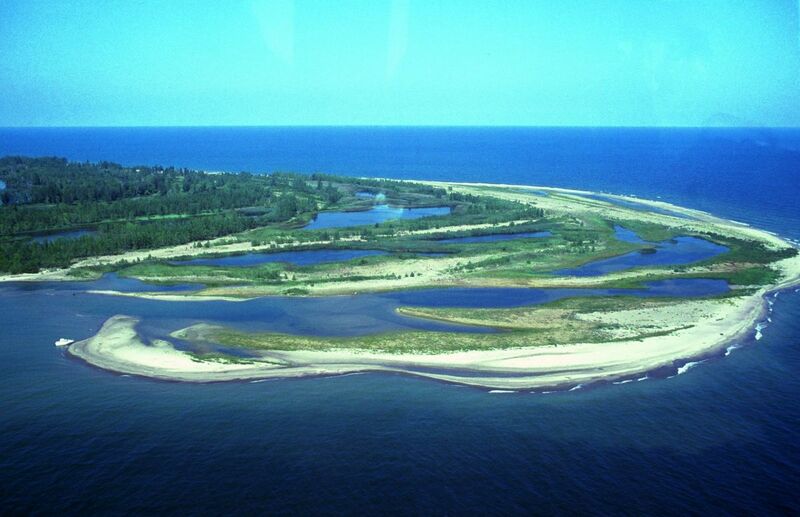 Next time, try to plan on going there in the second half of June. The lupines are blooming then. Spectacular!There is a big field of them across the street from Pollys. Great to look at while you are waiting to eat. The whole town (Franconia) has a Lupine Festival in late June-they are blooming everywhere then. Lupines are tall (3' to 4' ) multiblossom flowers that grow about a foot tall on several long stallks from the center of the plant like hollyhocks and delphiniums. They come in purple asd pink and white, purple being the most predominant and showiest. With so many restaurant chains everywhere you go, I love to find a place like Polly's and enjoyed some good old-fashioned pancakes. Lovely lens, really enjoyed it. Yummy! I don't dine out much, so I have to eat vicariously through others. The descriptions made me want pancakes. Too bad I am on the west coast. Great lens. What a fun place to visit -- and lots of pancakes too! 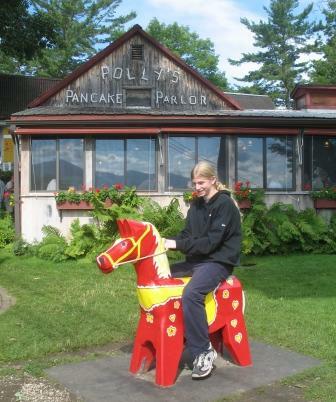 I went to a pancake place in NH years ago, but don't remember the name(it could have been Polly). The thing I remember was that they burned our pancakes! No I have never visited, but it sure sounds like fun and Yes, you have made me feel hungry. Love pancakes. I've been to North Conway a number of times - it's a great place to visit in the fall - but not sure I've eaten at Polly's. Is it in North Conway or outside? Anyway, based on this lens I'll be sur to visit next time. A mountain breakfast of pancakes with maple syrup sure sounds good to me at the moment as we come out of hibernation in New England.Thanks for the lens. Ah, it's in North Conway. I'll have to check it out next time I'm up there, which is usually at least once a year. I'll check back in with a report when I do. Sounds great, I only wish we had a Pollys Pancake Parlour. Welcome to The Cooks Cafe group! Sounds like a 'must-do' for pancake lovers in the vicinity. Good for Polly's, turning down the million measly bucks! Thanks for adding this to Culinary Favorites From A to Z and All Things Travel. Nice and thorough writeup. I've loved Polly's since I was a kid. If you're ever in southern New Hampshire, be sure to visit Parker's Maple Barn and Restaurant in Mason - pancakes, waffles, local tapped-and-made syrup and of course baked beans and all the fixin's. 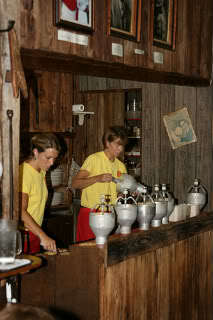 Love my pancakes with real maple syrup - must get up to North Conway in the off season to check out Polly's! Lensrolled to Flip the Pancake and Sing about Waffles. 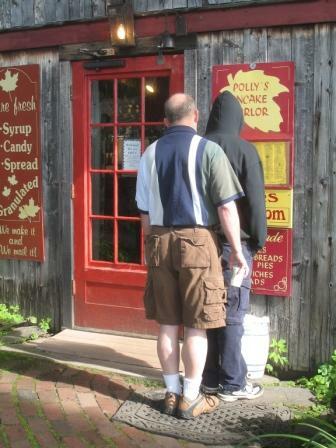 I may very well have to try out Polly's Pancake Parlor when we go up to Vermont next summer.